This is my first test post. We ladies here at MauiValue.com sell Hawaii Tours and Excursions from the Island of Maui. We are a family run business and have been located at he Sugar Beach Resort for over 30 Years! WE get to go out on all the fun tours and attractions to better help you (our potential customer) make the choices that are right for you. Whether you are looking for the Best of the Best in Hawaii Tours, simply want the cheapest there is; or a good value…we at MauiValue.com can help you out. Take Ziplines on Maui for example. There are 7 companies now on Maui and there is a big difference between the companies. They are all fun! However it is the little things that help a customer choose which one they would like to do…Sometimes it is simply price….for others it’s all those little things> it is not just how far across the canyons (250-2800ft! ), it is the types of harness you wear, how many ziplines you get to do in each tour, the trolley thing you carry and…there are 2 companies going side by side (makes it easy to take video and pictures of each other + the tour goes faster). Also 2 of the companies have panoramic ocean views and gourmet lunches served in remote locations again with those fabulous views!! 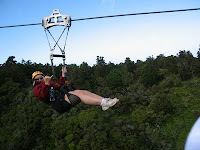 Next to Maui Luaus and Snorkel excursions to Molokini, Maui Zipline tours are the most popular tours on Maui. Expect most Zipline companies to be sold out well in advance, especially Kapalua & Kaanapali. *mostly because there are more people staying on that side of the Maui. Kapalua Ziplines has a total of 7 Zips, with 2 people going side by side; which makes it easy to take photos & video of your friends & family zipping along side of you. Kapalua Ziplines has split their Maui Ziplines into 2 courses: a 4 line ($149.00) & 5 line ($179.00) course or do all 7 for $249.00. Kapalua Ziplines also has a giant swing and challenge towers for the more adventurous. *the 5 line has that really great suspension bridge as well as zipline #3, the longest Zipline they have and we were doing about 40-45 miles an hour; again with that fabulous ocean view! Maui Ziplines is centrally located at the Maui Tropical Plantation and is great one for families as their weight requirements are only 50# – 250 #, children need to be at least 5 years old. If you make your reservations ahead of your arrival on Maui, you can pick and choose the Maui Zip line company you prefer; however if you are like most you will simply get what’s available when you arrive. If you have the time to choose a company, 1 of the things I point out is the harness itself. Some people really like the comfort of the full harnesses like with Piiholo & Kapalua (same builders by the way) vs the harness used on Haleakala & Kaanapali, however with this type of harness you have more control over what you are doing as you zip across the canyons. The younger more adventurous crowd loves the Kaanapali Ziplines because of the 8 Ziplines and the harness; not to mention lunch & views. 1 of the frequently asked questions we get is how high off the ground are you? The answer is different for each line, however expect 20ft + high. Most people scared of heights do not notice the height as you are not really looking down-but out towards the view or to your destination. Please be aware of each Maui Ziplines companies Safety requirements and policies. They are VERY STRICT on weights and most will weigh you at check in. My wife and I had a blast on the Zip line with Michael and Joey. They were a lot of fun and more importantly made us feel safe the eitnre time. This allowed us to truly enjoy ourselves. There is no doubt in my mind you all are #1!